In 6-quart Dutch oven, place beef, stock, soy sauce, brown sugar, onion, carrots, garlic and gingerroot. (The beef should be totally submerged. If not, add enough water to cover completely.) Cover and cook over medium-low heat about 3 hours or until beef flakes easily with a fork and is very tender. Remove beef, onion and garlic from Dutch oven. In large bowl, place onion. Slice meat and mash garlic; add to onion in bowl along with five-spice powder and sesame oil. Toss meat mixture until blended, adding a bit of the braising liquid to moisten as needed. 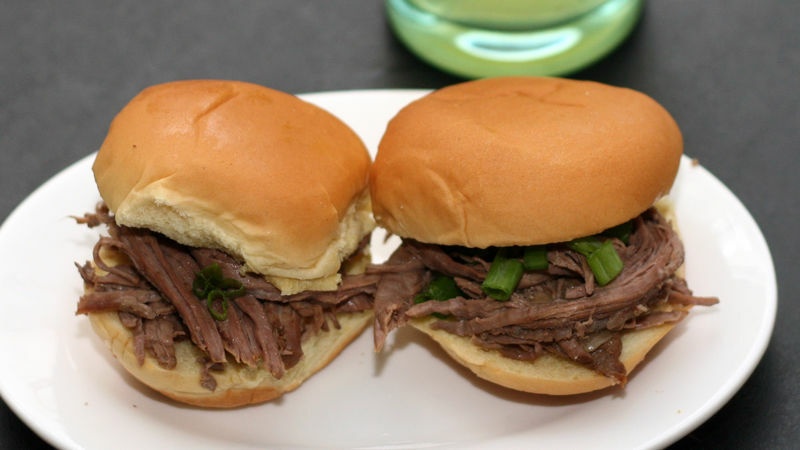 Divide beef mixture evenly among slider buns; top with green onions. Look for beef brisket that already has the fat cap removed. To safely and quickly mash the cooked garlic, use the back of a spoon.